California is leading the way in a groundbreaking push for safer alternatives to toxic chemicals. The California Department of Toxic Substances Control and the U.S. Environmental Protection Agency have agreed to make consumer products safer by promoting consistency in their methodology, minimizing duplication of effort, and setting up the framework to work together on Green Chemistry issues. SAN LEANDRO, CA – Consumers will see added momentum in California’s groundbreaking push for safer alternatives to toxic chemicals in everyday products following the signing of a landmark agreement today by the California Department of Toxic Substances Control and the U.S. Environmental Protection Agency. This formal agreement outlines principles by which DTSC and U.S. EPA will cooperate to reduce toxic chemicals in consumer products, create new business opportunities in the emerging safer consumer products economy, and reduce the burden on consumers and businesses struggling to identify what’s in the products they buy for their families and customers. The U.S. EPA is a leader in performing scientific evaluations that lead to safer alternatives. The Agency promotes the research, development and implementation of innovative chemical technologies that accomplish pollution prevention in a scientifically sound and cost-effective manner. 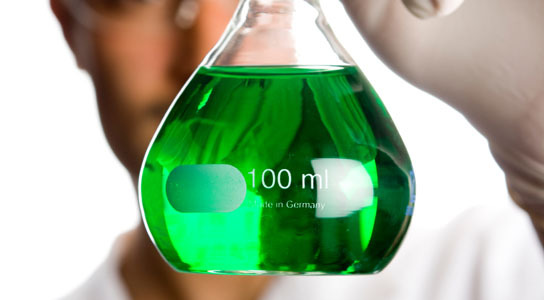 To accomplish these goals, the Green Chemistry Program recognizes and supports chemical technologies that reduce or eliminate the use or generation of hazardous substances during the design, manufacture, and use of chemical products and processes. This agreement will allow DTSC and U.S. EPA to minimize duplication of effort and promote consistency in our methodology, which will ultimately improve environmental protection. The agreement also creates a partnership between the two agencies and sets up a framework to collaborate on Green Chemistry issues so that California’s innovative “Green Chemistry” program can grow. “This is a major step in protecting Californians from unnecessary chemicals in everyday consumer products,” said DTSC’s Director Debbie Raphael. “The innovative spirit of this partnership also signals that government agencies can pool resources in a challenging fiscal environment to better serve the public,” she said. “Collaborating with agencies like DTSC allows the tools and research created by the EPA to be put into practice and be used to protect human health and the environment,” said Jared Blumenfeld, U.S. EPA’s Regional Administrator for the Pacific Southwest. The U.S. EPA’s Green Chemistry Program supports fundamental research in the area of environmentally benign chemistry as well as a variety of educational activities, international activities, conferences and meetings, and tool development, all through voluntary partnerships with academia, industry, other government agencies and non-government organizations. DTSC and U.S. EPA signed the agreement in a ceremony at California’s Kaiser Permanente Sidney R. Garfield Health Care Innovation Center in San Leandro. Kaiser Permanente is nationally recognized as an industry leader in safer products, using its purchasing power and a sustainability scorecard to press suppliers for safer chemicals in medical products. The agreement represents a major advance for Californians looking to buy safer children’s toys, personal care products, household cleaners and other products. By shifting the question of an ingredient’s toxicity to the product development stage, concerns raised by Kaiser Permanente and other consumers can be addressed early on. The approach results in safer ingredients, and provides an opportunity for California industry to once again demonstrate its innovative spirit by making products that meet consumer demand throughout the world. DTSC’s informal draft Safer Consumer Products Regulations, scheduled to be finalized in 2012, will require manufacturers of selected products sold in California to identify safer alternatives to a potential range of 3,000 chemicals known to be harmful to public health and the environment. DTSC expects to release its draft Safer Consumer Products Regulations in early 2012 for public comment. The Regulations are a cornerstone of California’s landmark Green Chemistry Initiative signed into law in 2008. Be the first to comment on "EPA and DTSC Push for Safer Consumer Products"